Ever since I saw "The Exorcist" as a kid I have had a certain love and fear of possession films. With that in mind you can imagine my excitement then when I saw the trailer for this film, every time I'd see the advert on TV I'd go quiet and my anticipation for its release were growing and growing. Unfortunately for me I couldn't afford to go and watch it at my local cinema and ad to wait even longer until its DVD release. Now one thing I loved about this feature was that it wasn't your average 'possession' film, the story telling is absolutely amazing and the court scenes bring a great authenticity to the film and as someone who likes to watch a lot of true crime stories and has a fascination of the paranormal I found the whole thing riveting to watch. Because of this difference though the film got a lot of criticism, criticism which I never understood. To me this film took it's audience seriously and didn't treat us as numbskulls. It also tried to do something different and not throw in all the same cliches that we'd already seen time and time again in films like this. Jennifer Carpenter did an absolutely amazing job in her role as 'Emily' and I think she deserved a lot more praise for it. The rest of the cast, including the likes of Laura Linney and Tom Wilkinson, also put in some strong performances that draw you in to the story. Also a credit to the writer/director Scott Derrickson, who's had an affinity with 'paranormal' style films since. 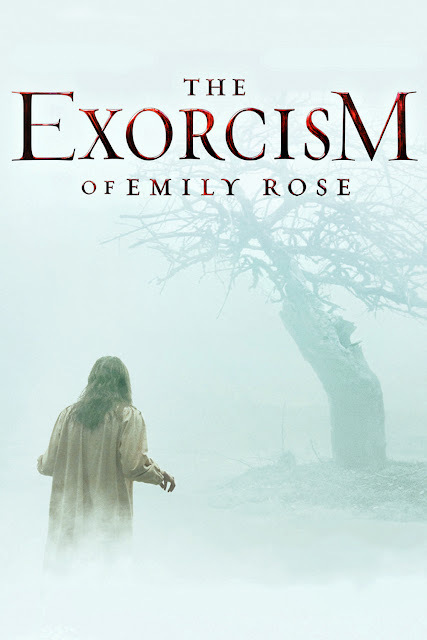 "The Exorcism Of Emily Rose" is a brilliant film that seems to suffer from a bad reputation which I have never understood, do yourself a favour and go back and watch it again and give it another try. Based on the true story of Anneliese Michel, a young German woman who suffered a similar fate to the fictional Emily Rose in the 1970s, and "The Exorcism of Anneliese Michel", an account of the subsequent court case by expert witness Felicitas D. Goodman, an anthropologist called in as an expert on possession. Michel's parents and the two priests who performed her exorcism were prosecuted, though the prosecution asked that the parents be excused from punishment as they had "suffered enough". Ultimately, the accused were found guilty of manslaughter resulting from negligence, and the two clergymen were sentenced to six months in jail (which was later suspended) and three years of probation. The most significant differences are that Michel periodically fasted for several months as part of her exorcism and remained on medication until her death, while the fictional Rose was incapable of eating due to demonic forces and decided herself to stop taking her medication with the consent of her care-providers. The story was heavily adapted for cinematic purposes. Jennifer Carpenter's audition was so convincing and scary that the director decided to cast her right then. There were two dolls constructed for this film. The first was where Emily Rose would lock her limbs. The other was during the dorm scene where she is on the floor in a twisted position. The director ultimately never used a doll in the dorm room scene because he found out that Jennifer Carpenter is incredibly flexible and decided that the positions she was able to contort herself into were more unsettling than what could be accomplished with the dummy. When Emily starts to bend over backwards in the church, Carpenter wore a harness to make the effect more inhuman. To prepare for her role, Jennifer Carpenter spent hours in a room full of mirrors. She tried out different body positions and facial expressions to see what was the scariest. The "silent scream" helped Jennifer Carpenter get the role of Emily Rose. Scott Derrickson found it terrifying in her audition. Laura Linney recommended Jennifer Carpenter for the role of Emily Rose after working with her in a play. Linney described Carpenter as the "best young actress I've ever seen. She's spectacular." Scott Derrickson had planned on using lots of visual effects to make Emily appear possessed. But after seeing how Jennifer Carpenter could contort her body, he decided he would barely need them. The filmmakers say they weren't interested in making just another horror movie. They wanted to make a "smart movie about whether demonic possession really exists." Scott Derrickson wanted this movie to make people ask questions, not think they got the answer. The filmmakers say that Rashomon (1950) was a huge influence on this movie. In that film, four different witnesses recount the story of a murder in court from their perspectives. The jury was not given scripts so they weren't aware of how the case would turn out. Mary Beth Hurt asked them how they would find Father Moore. The decision was split. The movie was filmed in Vancouver in 2004. But Scott Derrickson wanted it to seem like it could be anywhere and timeless. Emily's bedroom and the scratches on the wall were based directly on a painting by Francis Bacon. Scott Derrickson was greatly influenced by the work of Dario Argento. An extra in one scene actually claims to have underwent an exorcism. According to a newspaper article the character Erin reads towards the beginning of the movie, Emily was 18 and attended Danbury State University. Though the actual story happened in Germany, the movie takes place in US. Scott Derrickson had Jennifer Carpenter watch The Passion of Joan of Arc (1928) to prepare for one scene. Scott Derrickson says that as a Christian he relates most to Campbell Scott's character. The filmmakers studied courtroom dramas like The Verdict (1982) and Anatomy of a Murder (1959) to prepare. The colours in the flashbacks were made to look more realistic to mirror the tone of the testimony. The bar was actually on the first floor. The crew painted the city skyline. Laura Linney was excited to work with Tom Wilkinson, having been an admirer of his for some time. To get one shot, Tom Wilkinson had a camera harnessed onto his body and aimed back at his face. Other shots were achieved by placing cameras on dollies and tripods. Jennifer Carpenter wasn't able to use both sets of her vocal cords. The effect was with sound editing. Mary Beth Hurt's husband, Paul Schrader, directed Dominion: Prequel to the Exorcist (2005). Madeline Zima was considered for the role of Emily Rose. The cinematographer hung a camera on a rope to get some of the odd angles. They called it the "string cam." Interestingly, Duncan Fraser got his start in The Haunting Passion (1983). According to the production designer, the courtroom was influenced by Frank Lloyd Wright's architecture. Laura Linney and Campbell Scott had acted together before, in Lush (1999).